I've been in relationships with GPS watches for many years. They've come into my life in many colors, shapes, and sizes and have gotten a lot smarter and more attractive over the years. We've had many great memories together of crossing finish lines and beating PRs, but we've also endured some tough times and been on extended breaks. How do you know if it's love, an emotional attachment or has crossed the line into an unhealthy obsession? Is your GPS watch trying to steal you away from your one true love of running? Is it the ultimate love triangle between you, running and your GPS watch? This post contains affiliate links, that means if you make a purchase using one of my links, I make a small percentage of the sale with no additional cost to you. Thanks, as always, for your support. Just like any bad relationship, Sometimes your GPS watch doesn't tell the whole truth. If you become too attached the data the GPS displays it could be a sign you are in an unhealthy relationship. The technology has gotten better over the years, but you can't depend on your GPS to be 100% honest all the time. Sometimes the signal is weak and isn't displaying the most accurate information or it's slow to catch up to display your average current pace. Forget the calorie burned numbers, those are always estimates, even when heart-rate is factored in. If you're adjusting your effort or calories consumed to match inaccurate data it can lead to unnecessary frustration and perceived failure. My husband and I run side-by-side in the same neighborhood with the same model GPS watch and it often displays slightly different data. Sometimes it will say his pace was a few seconds faster even when I cross the finish line (aka our driveway) first. Date your GPS watch data, have fun with it, don't marry it. In any good relationship, it's important to spend quality time together but also enjoy time apart. If you skip your run because your GPS isn't charged or feel emotionally distressed because you forgot your watch before a race, it may be a sign you're too dependant on the technology. The GPS watch is just a tool and shouldn't be a crutch. It's there to provide feedback, not to control you. A GPS watch is great for analyzing data and tracking improvements, but it's not the boss of you. The watch provides feedback, how you use that feedback is the difference between a healthy and unhealthy relationship. The watch provides data, but so does your body. It's important that you listen to your body's needs first, then the needs of your partner, the GPS watch. When your body tells you the intensity is too much, but you haven't hit your desired pace on the watch and you prioritize the GPS feedback over your body's feedback, it can lead to injury, burnout, and frustration over time. If you always run with a GPS watch and live-and-die by the numbers, you never give yourself the opportunity to learn to run by feel. What pace is easy? What pace is challenging? Do you know what a nine-minute mile pace feels like without the watch? I love running using the rate of perceived exertion chart. It's a fantastic way to break free from number crunching and run by feel. Just because you don't run with a watch doesn't mean you can't push yourself to faster paces. In fact, sometimes the watch can influence us negatively. If you hit a pace that is faster than what you are used to, you may slow down because you know that pace is "supposed" to be hard. Subconsciously, it may scare you. When you run by feeling you may be surprised to hit faster paces. Technology can actually undermine our results if we are not careful. Learn more about how your fitness tracker can sabotage results in this blog post. Break free of a codependent relationship and run by feel sometimes. Running is supposed to be an enjoyable experience. Really! When you lose the joy of running because you're too attached to numbers or performance, it can be a sign it's time to break up with your GPS watch. Slow runs are an important part of the training cycle. 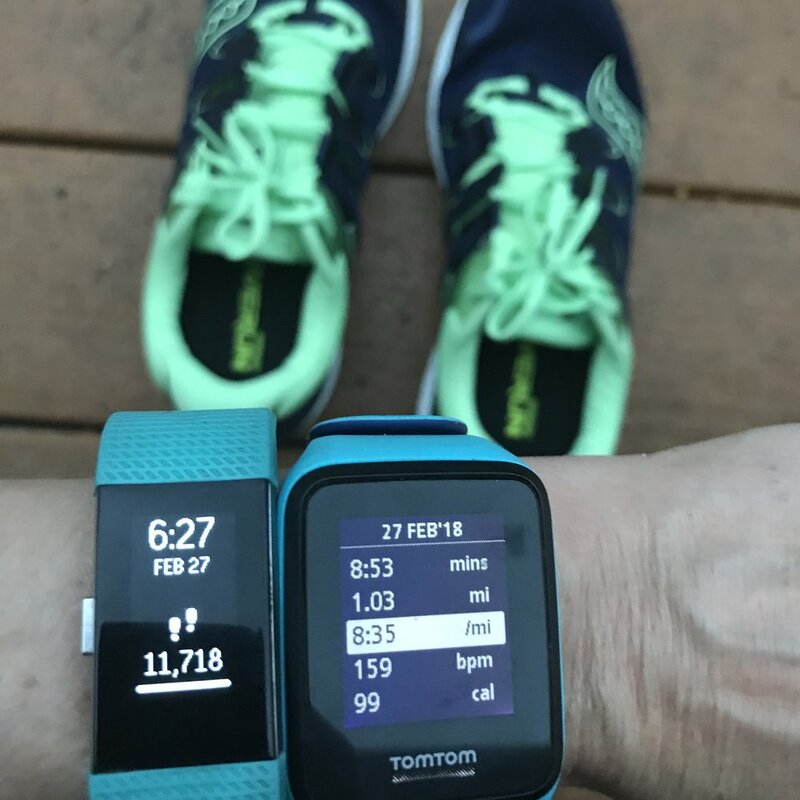 If you get to the point when every run has to be fast because you need share your GPS data on Instagram, it may be a sign it's time to leave the watch at home and just hit the pavement like when you first fell in love with running. I'm not your negative Nancy friend who doesn't "get" your relationship. There are many benefits of running with a GPS watch. You can have a healthy relationship with a GPS running watch. In any good relationship, it's important to be open to feedback from your partner, but ultimately do what is best for you. The GPS watch gives fantastic detailed feedback about your runs. If you analyze that data, use it to track improvements and to adapt your training schedule while prioritizing your body's feedback first, you have a healthy relationship with your GPS watch. We can't do everything ourselves, so having a partner to help map your plans is a major benefit of healthy relationship with a GPS watch. You don't have to drive your car around the neighborhood to figure out the distance or do complicated math in your head during your runs. The fact that you can hit the road in any direction and your watch will tell you when you hit your desired distance is a major benefit of a GPS watch. Sometimes in relationships, we can get stuck in our own heads, only considering our own point of view and we don't see the whole picture. A healthy relationship can help you see a new perspective. A heart-rate HR monitor on a GPS watch can be valuable feedback on how hard we are working. Paces and distances reviewed after your run can help you see improvements over time and help you stay on track to reach your goals. Using the GPS watch to monitor your progress and see the big picture is a healthy way to use the technology. I have a GPS watch and If you follow me on Instagram (You don't? Go do it now!) you know I wear the TomTom Spark for most of all my outdoor runs, but I don't get too attached to the data. A lot of runners love their Garmin and that's great. Sure, it's fun to see fast paces or hit a new distance, but I make a conscious effort not to listen to my gadget over my body. Your GPS watch is a friend with benefits. Have fun with it but don't get too emotionally attached. Thank you! Let me know if you have any questions. I am here to help. Like this post? Know someone who it might benefit? It helps me when you share with your friends and followers.